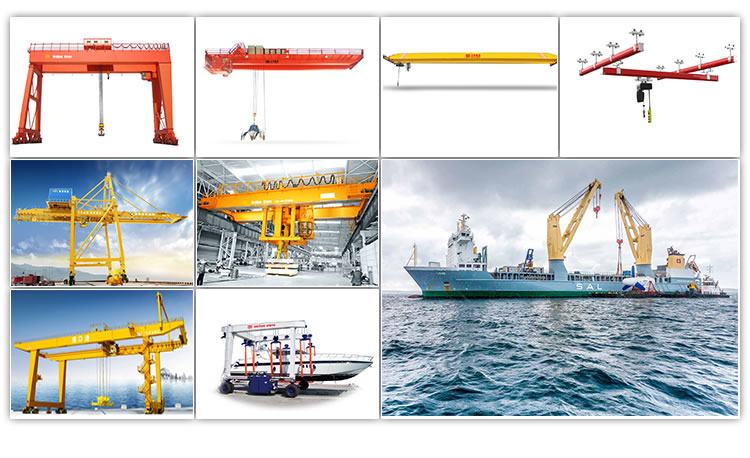 Wall-Traveling Jib Cranes offer long lateral motion of substances without taking up floor area or interfering with heavyduty overhead cranes. Wall-traveling jibs boost overall plant growth by quickly tackling smaller lifts. 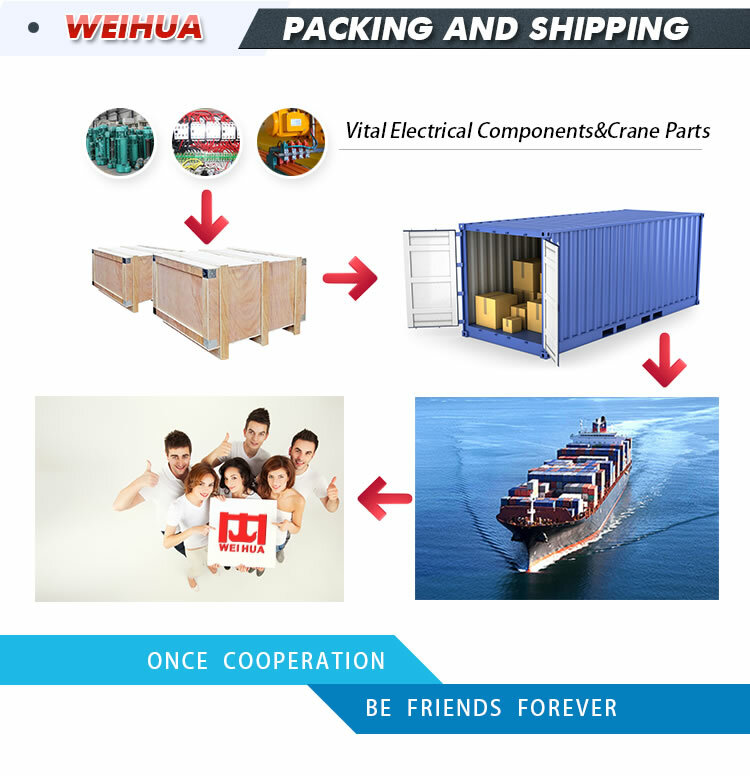 You may download wall traveling Jib Cranes Manual for detail after contact us. 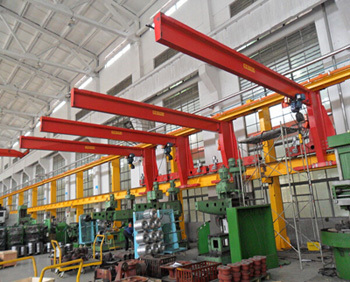 Jib boom is produced from standard "S" beam with vertical angle truss to reduce deflection; jib boom and truss bolt onto the back frame—no welding needed. End trucks are constructed from channel beam frames and resist twisting; the end trucks are jig-fixed for optimal fit and travel. End trucks bolt onto the jib's back frame. Crane drive owns an electric motor with worm gear reducer. Variable frequency drives (VFDs) for multi-speed operation. 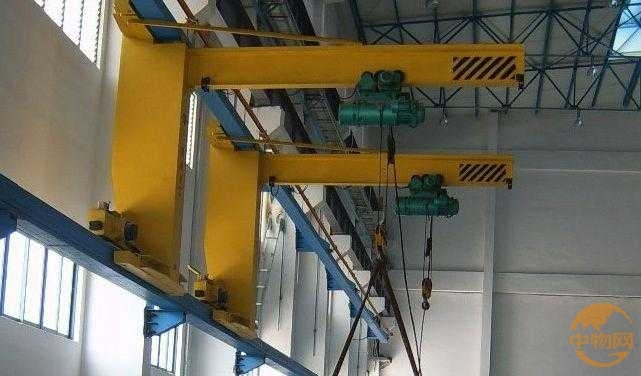 There are useful where overhead cranes are not practical or feasible. They offer 360 degree floor coverage, allowing unrestricted placement of machinery and equipment. These mount easily to any substantial structural steel buliding column, at any desired height. 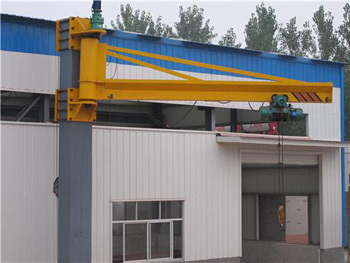 The crane has a structural steel finish, in highly visible yellow enamel. 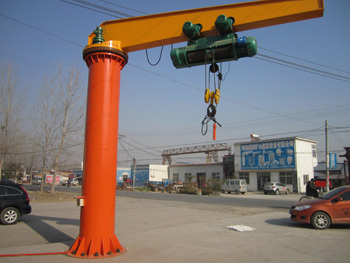 Free standing jib crane install almost anywhere, including outside. There foundation-mounted, freestanding jibs offer higher capacities, longer spans, and greater rotation than wall-mounted jib cranes. 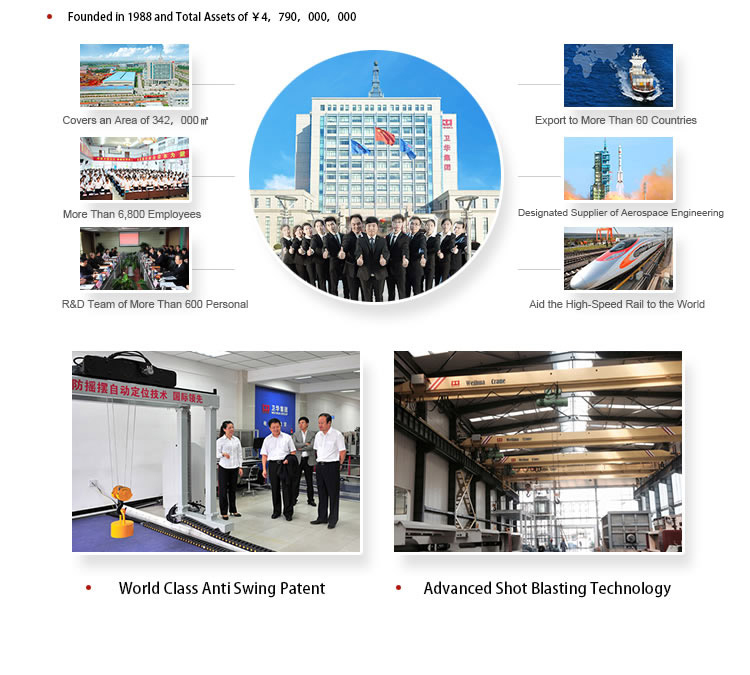 From 1988 to the present, WEIHUA Group started from an area of less than 3 acres, 100000 yuan investment in the workshops to the current development of The employees is more than 6800, the whole coverage production base of large crane is 3420000 square meters. WEIHUA annual sales reached 1 billion yuan in 2006. 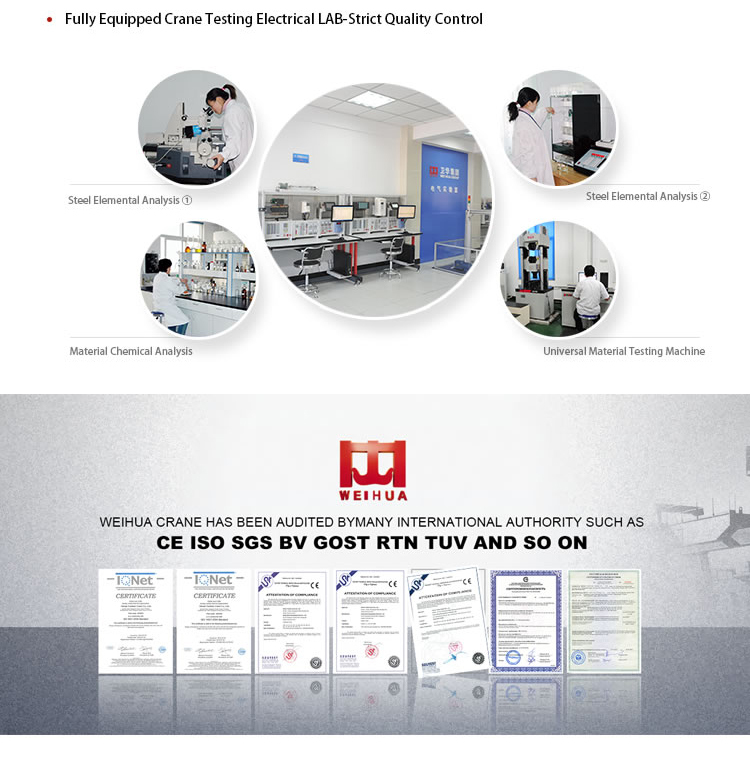 Won social-wide recognition and praise by credit management and good service, took the lead go through the ISO9001 quality certification in the local area and same industry by its strict quality management and stable product manufacturing quality, WEIHUA initially forms the enterprise culture, enterprise image and widely brand influence with Weihua characteristics. Furthermore, as the designated supplier of Jiuquan Satellite Launch Base, Weihua accelerated the launch of Chang'e successfully.